Imagine Mario Kart, Looney Tunes and Top Gear got together to plan a wild, rockin' birthday party for a 9-year-old. The result would probably resemble Skylanders SuperChargers, the latest game from Activision and Vicarious Visions, due to launch in North America on September 20th for PlayStation 3, PlayStation 4, Xbox 360, Xbox One, Wii U and iPad. This is the first Skylanders game to feature vehicles in its toys-to-life lineup -- and we're not just talking cars. SuperChargers takes to the land, air and sea with 20 vehicles and 20 characters, although of course most of these will be sold separately. The SuperChargers Starter Pack ($75) comes with two characters, one car and a portal, and that's all you'll need to complete the main game. The rest of the game, with action-packed water tracks and cloud-streaked midair passages, looks so intriguing that players and parents alike will most likely be tempted to splurge on additional planes and submarines. Standalone vehicles cost $15, while characters are $13. 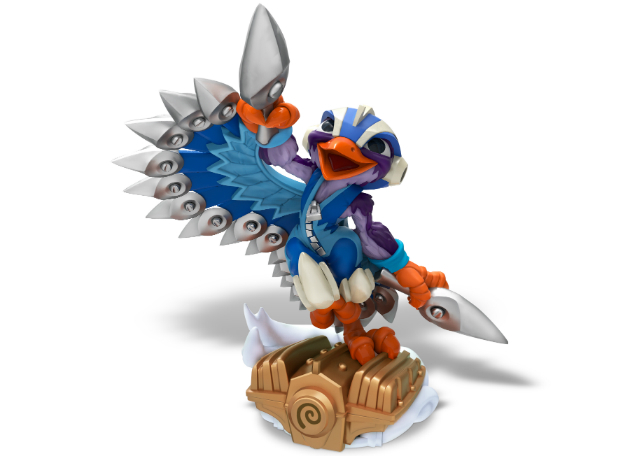 As a bonus, though, every existing Skylanders figure will work with SuperChargers. Players can use any character with any vehicle they wish, but each car, plane and boat has a corresponding driver. When that character is behind the wheel, the vehicle gets special upgrades, such as more firepower or unique attacks. Plus, they look pretty cool together: The bird character Stormblade, for example, has silver-blue plumage and sharp-tipped feathers with wavy, aerodynamic details. SkySlicer, Stormblade's paired jet, features a similar aesthetic, almost as if it were her custom helmet enlarged 50 times over. SuperChargers pits players against series antagonist Kaos and his "Doomstation of Ultimate Doomstruction," which eats the sky. Considering the game plays out in a place called Skylands, that's a fairly big deal. A few former Skylanders characters show up in SuperChargers, with some modifications -- Super Shot Stealth Elf, for example, is a new twist on the classic figure, adding a new weapon and the ability to lay down an auto-attacking turret as she goes invisible. She's one of the Starter Pack characters, alongside newcomer Spitfire and his paired car, Hot Streak. At first glance, the car portion of SuperChargers looks eerily similar to other cartoonish racing games, most notably Mario Kart. There are winding tracks with collectables and speed boosts along the way, and players are able to drift around tight corners or between obstacles. Speeding down streets in the sky isn't the only option here, though -- there are also mini battle arenas where players must maneuver their cars to shoot down enemies and figure out laser-based puzzles to move forward. The game also features secret side-tracks lining the streets -- and then there are the non-road areas. These are technically side quests, not necessary to finish the game, but impossible for any completionist to ignore. Plus, they look like the most innovative portions of the game. Flying features a lot of swerving, shooting and weaving, but the game's true newness comes in with the water sections. Each seafaring vessel is able to dive below the water's surface, so there are technically two tracks for every boat level: one on the water and one underneath. 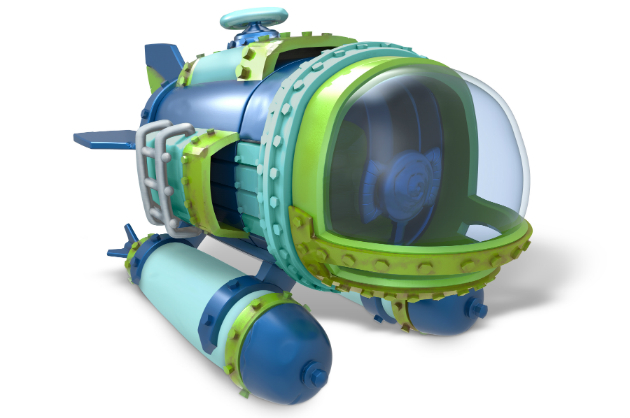 One of the boat-based boss battles, using the Dive Bomber submarine figure, features a circular pool with a wave-making machine in the middle and dozens of enemies scattered around it. Players have to dive beneath the water to dodge attacks and get some air by ramping off of waves at the right times. Eventually, players dive directly beneath enemies so that the boss' shots take out the baddies for them. It's all hectic and complex, and it looks like a solid culmination of many different skills picked up throughout the game. SuperChargers is a big game with new features (aside from the jets and subs), including one level that takes place on the back of a dragon, a top-down flying section, a 2D submerged area and a portion with a shrink-and-grow ray. Plus, players can customize their vehicles on the fly by picking up spare parts along the levels. Oh, and since it's a video game featuring cars, planes and boats, we asked Activision the obvious question: Will there be racing? "Where would your mind go?" a developer responded, while literally stroking his beard as if in deep thought. Our minds go to, "Yes."